On the north side of Sauchiehall St between Scott st and Charing Cross once stood the graceful terrace of Albany Place. Comprised of 6 houses set back from the road with ample gardens, three of them once housed the [img]Royal%20School%20of%20Shorthand[/img], the Standing Conference for Women and the Margaret Hopkins School of Dancing. They're still there! Hidden away behind a series of buildings that were constructed in the gardens of the houses. It's difficult to see them, theres hardly a trace visible from either Sauchiehall or Renfrew St. The only way in to the first three is through Albany chambers at 534 Sauchiehall St... something I've yet to try out! Another has been incorporated into the Royal Highland Fusiliers Regimental Headquarters and Museum. The next has been incorporated into that den of iniquity, The Garage. The once detached villa forms the G2 club at the rear, the bar being the original drawing room. The clubs small carpark was once the yard of John Gray & Co, monumental sculptors yard, the company that repaired the Stone of Destiny after its removal from Westminster Abbey in 1950. "As once people could walk through the garden surrounding the villa, they will be able to walk around the cultural garden surrounding the newly created villa"
Bit out of date, old Crusty. The CCA opened a couple of years ago, and the old house is certainly viewable from the restaurant area. Iv just totally plagarised Carol Foremans Hidden Glasgow too! Iv never heard of Albany Place tho... I was wonderin if anyone else had? Interesting stuff. I'll need to go and have a look in the CCA. 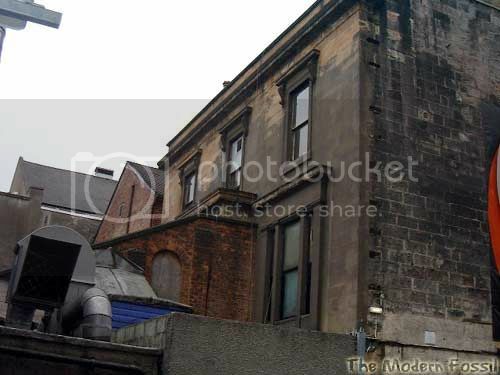 At first I thought you were talking about the fancy hooses further along Sauchiehall Street that I noticed a while back while looking for the garnethill observatory (someone posted a query about it last month). Ye can see a bit of Albany Place, and the other hooses on this map. I'll lead the call for photos!! This is the Garage Villa. Its the only one you can see, i think from street level. You can see the east end of the street by going up Scott Street and looking left, before Renfrew Street. There used to be a stamp shop and another club/disco here. This is also at street level (but quite a bit above Sauchiehall Street street level). Excellent pics as per Fossy! Notice the brck tunnel connecting it to the Garage via the original Greek Porticod entrance. The staircase inside is still in the original position although, is a replacement. The rooms have been divided and the windows blocked up, so its difficult to make out the original layout... especially if ur pished on cheap voddy!!! All that remains are the pillars in what was the hall and two fireplaces in the drawing room; now the bar. 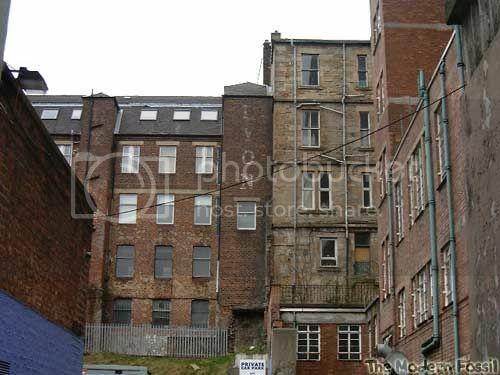 Interesingly, your second foto shows the old Lyon factory on Renfrew St. My gran remembers a delivery truck coming down the hill from the factory and slamming straight into the tea house and tenement facing it, where the brick-built Royal Bank of scotland stands now, could have been the 1920/30's. I remember reading recently that, although most people remember the demolished building as being a Lyon's Corner House teashop, it was in fact a stationers, with the name Lyon. Anybody else come across this version of the story? I'd seen this street on old maps before, never thought it's buildings could still be there though. Looking at the map amcd linked to Albany Place is where the Lacarno building is now (Berkeley Casino). The entrance to the street is still there in the form of the garage entrance to the building. From what I can see from the maps and the Photo Atlas, there were about ten townhouses of which four or five remain. The Lacarno building flattened the rest. The row now ends at the abandoned Bank of Somewhere building. This means the G2 building is not part of it apparently. It is on the same alignment though, so Albany place could have extended all the way to there originally. But it looks like where Mr. Chips etc. is now, was part of that houses gardens, and Albany Place was built beside it. The CCA, that's two blocks away isn't it? p.41 - The building [on the corner of Sauchiehall and Elmbank Streets] is Lyon's stationery shop, which closed after a dramatic fatal accident in the mid-1960s when a runaway lorry rolled down Garnet Street beside the Beresford and embedded itself in the shop. Yup, it certainly does say that. Excellent book, thanks for the recommendation. Just got hold of another book called The Twilight Years of the Glasgow Tram - dozens of colour pics, of which I'll be scanning and posting some soon. A bit blurrier and darker than The Streets of Glasgow, but still some interesting colour views from the early 60s. Watch this space! Well, the pre-1980 colour space to be more accurate!